All doors by Manchester based Force 8 in composite. The recently developed smooth finish from Force 8 gives the impression of aluminium with all the benefits of a full composite door. You can now choose from Force 8’s smooth finish or their wood grain finish giving you the best of both worlds. Our smooth finish has been heavily influenced by the home improvement industry as it leans towards windows that are in anthracite grey as well as using aluminium material. Matching the smooth finish with our anthracite grey colour gives the ultimate impression of a full aluminium door and to further this, you can choose from a wide range of Blue 316 grade stainless steel hardware. The Zermatt door by Force 8 is the first two tone contemporary design to feature in the market. 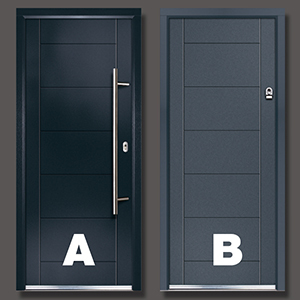 Anthracite grey is the main colour of the door and you can choose the second colour that features on the design, from a range of 210 RAL colours. Don’t hesitate to contact Force 8 to discuss our smooth finish on our exclusive composite doors. Click here to look through our new door designer.